This photo shows the property that became 2 High Street in Thornbury as it was in the early 1900’s. Note the name board of the Berkeley Vale Motor Company is interesting. We had originally thought that this was an advertising hoarding for the company located at Alveston. However we discovered new information which made us re-think (see below). “All that messuage with stable and other outbuildings formerly in the tenure or occupation of James Prewett then since of ……. (.blank) Rogers linen draper and afterwards of Edward Williams pig butcher then late of Daniel Pitcher Knapp and then Charles Putley adjoining to a messuage or tenement formerly in the occupation of Samuel Penduck then since of John Lane plumber and then of …. (blank) Lane his widow on the southward part to another messuage or tenement formerly in the occupation of Obed Pitcher saddler then since of William Philpotts basket maker and then of Messrs Harwood Hatcher and Company on the northward part and to a street called the High Street on eastward part thereof“. James Rogers – trade directories show that it was James Rogers who was a linen draper in Thornbury in 1830. We don’t know any more about James. The 1840 Tithe Survey shows this property as Plot 47, a house and yard owned by Nicholas Cornock and occupied by Edward Williams. Nicholas Cornock – Nicholas Cornock was a farmer living at Tan House Farm, Aust. In the 1851 census he was living there with his wife, Elizabeth. Nicholas was 70 years old and a farmer of 149 acres born in Berkeley. Elizabeth was 64 and born in Hill. The children living with them at that time were Elizabeth, who was 31 years old, Susanna aged 28 years and William also 28. We don’t know how or when Nicholas acquired the property at 2 High Street. In 1844 he sold it to Daniel Pitcher Knapp. We think Nicholas died in 1860. Daniel Pitcher Knapp – an indenture dated 2nd March 1844 shows that Daniel Pitcher Knapp purchased the messuage or tenement from Nicholas Cornock. Another indenture of 8th March 1844 shows Daniel obtained a mortgage of £120 from William Dorney. On 28th August 1846 this mortgage was transferred to Joseph Betty and Daniel borrowed a further sum of money making his debt to Joseph Betty £200. Daniel Pitcher Knapp made his will dated 9th November 1846. He devised the messuage in which he was living in the High Street which he had recently purchased of Nicholas Cornock to the use of his wife, Amelia Knapp her heirs and assigns for ever and he appointed her his sole executrix. The 1851 census shows them living there. Daniel was a grocer and blacksmith aged 38 and Amelia was aged 41 from Morton. Charles Putley – the 1861 census shows Charles and Hannah Putley were living at 2 High Street, Thornbury, next to the Bank. Charles was a coach proprietor aged 46 and Hannah was aged 45 born in Tytherington. Also visiting them were Sarah Poole unmarried aged 50 from Tytherington and her son, Charles Poole. On 27th June 1866 there was an advertisement for the sale of “all that Freehold Dwelling House and Shop in the High Street of Thornbury in the occupation of Mr Charles Putley, General Shopkeeper and Omnibus Proprietor. The Property comprises Shop, sitting room, kitchen, five bedrooms, cellar, stable, Bakehouse, Lofts, Brewhouse, Yard, etc and are centrally situated and well adapted for business purposes. To view apply to tenant“. Frederick Sainsbury – the 1885 Rate Book shows the property occupied by Frederick Sainsbury. We are not sure which Frederick Sainsbury this refers to. Albert Edward Sainsbury – the Special Drainage Rate Book of 1894 shows that Albert Edward Sainsbury rented this property from John Hodges Williams. The 1901 census shows that Albert was a saddler and harness maker aged 35 living there with his wife, Elizabeth Y aged 27 born in Alveston and Florence B aged 4. Albert was listed as being there in the 1901 Rate Book. Albert was baptised on 5th August 1865. He was the son of William Young Sainsbury, the relieving officer and his wife, Elizabeth Hannah. On 6th October 1894 Albert married Elizabeth Young Jones, the daughter of John Ford Jones, a farmer from Alveston. They had a daughter, Florence Beatrice baptised on 4th October 1896. Elizabeth died on 10th January 1902 aged just 28 years. Albert re-married in 1905 when he was 40 years old, this time to Cecilia Annette Price, aged 28 the daughter of Henry John Price, solicitor’s general clerk and his wife, Sarah. Cecilia was born in Birmingham on 22nd February 1878. In 1891 the Prices were living at Stroud and in the 1901 census Cecilia was working as a domestic cook in Cromhall Rectory. Albert and Cecilia had one son, Lionel Edward Sainsbury born in 1906. Albert Edward died on 19th July 1908 aged 42 years. The 1910 Rate Book shows that the house was occupied by ‘Mrs Sainsbury’ who we assume to be Cecilia. She re-married in 1910. Her new husband was John Blizzard (see below). The 1911 census shows Albert’s daughter, Florence, went to live with her grandparents, William and Elizabeth Sainsbury at The Coombe. She went to Miss King’s Private School before joining the Council School and then going on to the Grammar School. She must have moved to The Coombe to live with her grandfather, William, as she was shown at that address when she married in 1920. Her husband was Ivor Henry Alsop from Roath, the son of Edward Alsop, managing director. Witnesses included William James Jones and George Sainsbury Hosgood, presumably her cousins. William John and Cecilia Annette Blizzard – Cecilia was Albert Edward Sainsbury’s second wife whom he married in 1905 (see above). She took over the house after Albert’s death in 1908. In 1910 she married ‘John’ Blizzard. John was born on 1st February 1881, the son of Henry George Blizzard and his wife, Sarah (nee Savery). The 1881 census shows John living with his mother in Thornbury Road, Oldbury. His father was not at home at the time of the census and we think he was lodging in 2 Elliotts Buildings near Brandon Hill in Bristol. He was working as a watchman. In the 1891 census the family were all together. Henry was a coachman and they were living at 66 Alma Vale Road, Clifton. The 1901 census shows John living at 1 High Street boarding with Emma Phelps who was distantly related to John. The obituary of Emma’s husband, Robert Phelps, says that John was Robert’s nephew, but we believe that it was John’s father who had been Robert’s nephew. He was a hairdresser’s assistant aged 20. There is some confusion about where the Blizzards were living and where John had his shop after their marriage. The 1910 Rate Book shows John at 1 High Street, having presumably taken over the shop following Emma Phelps’s death. A plan showing the properties owned by John Hodges Williams in 1911 also shows John at 1 High Street. However the 1911 census shows John and Cecilia living at 2 High Street. John was a hairdresser and tobacconist aged 30 born in Oldbury on Severn. Cecilia was a saddler and harness maker aged 34 born in Ashton, Birmingham. Living with them was Cecilia’s son from her first marriage, Lionel Edward Sainsbury aged 5, her sister, Alice Isobel Price aged 22 born in Stroud, John’s brother, Arthur Blizzard, a hairdresser’s assistant aged 22 from Bristol and a boarder, Henry Percival Marshall, a chemist’s assistant aged 21 from Portsmouth. The census implies John was undertaking his hairdressing business ‘At Home’. In December 1917 when John Blizzard (as he was then called) made his application for emption from military service he gave his address as Warrington House. At that time it was clear that John had health problems. He said that he was deaf through fever, that he had a weak knee through injury and that he had only partial use of right arm. This last problem was through an injury and the limb having been badly set. In 1919 Mrs Blizzard of the High Street was shown as the guardian of Harry Lewis born October 1914 when he started school. Harry left town the same year. We do not know if this a temporary fostering or if he was related to Cecilia. We understand that John was known as ‘Bunter Blizzard’ and that this derived from his size. We don’t know how long they stayed at 2 High Street, but by 1925 they had moved to premises on the opposite side of the street at 23 High Street. However we note that 23 High Street became known as ‘Warrington House’ and we discovered a record dated December 1917 referring to John being exempted from military service because he was deaf through fever, had a weak knee and only partial use of his right arm. His address at that time was said to be ‘Warrington House, Castle Street‘. We think it is possible that this may refer to the same house which we know as 2 High Street in which case John and Cecilia were still living there in 1918 and that they transferred to the name of the house to their next shop at 23 High Street. However it is possible that the reference to Castle Street was a mistake and John and Cecilia had moved to 23 High Street by 1917. We understand that John only cut men’s hair. We have also been told that he also acted as a dentist but we have no confirmation of this. We assume that John and Cecilia lived at 23 High Street until their deaths. John appears in trade directories as a hairdresser in the High Street until 1939. The special register compiled in 1939 in preparation for the war shows John and Cecilia living at Warrington House with Cecilia’s sister, Winifred Price who was born on 3rd July 1886. John died in Thornbury on 22nd February 1940 aged 59 and Cecilia died in Thornbury on 13th February 1941 aged 64. Probate was granted to her son, Lionel Edward Sainsbury, hairdresser and tobacconist. He had married Ellen G Marklove in 1929 in the Sodbury area. The 1935 Kellys Directory shows Lionel as living in Alveston. Lionel died in 1944 aged 39 and was buried in Thornbury Cemetery on 25th October 1944. The burial record shows he was still working as a hairdresser and that he died in the High Street, so it’s possible that Lionel moved back to take over his parents home and business at 23 High Street until his death. Thornbury Cycle and Motor Works and Berkeley Vale Motors – the photo at the top of the page shows an advertising hoarding for Berkeley Vale Motors. We had originally thought that this was an advertising hoarding for the company located at Alveston. 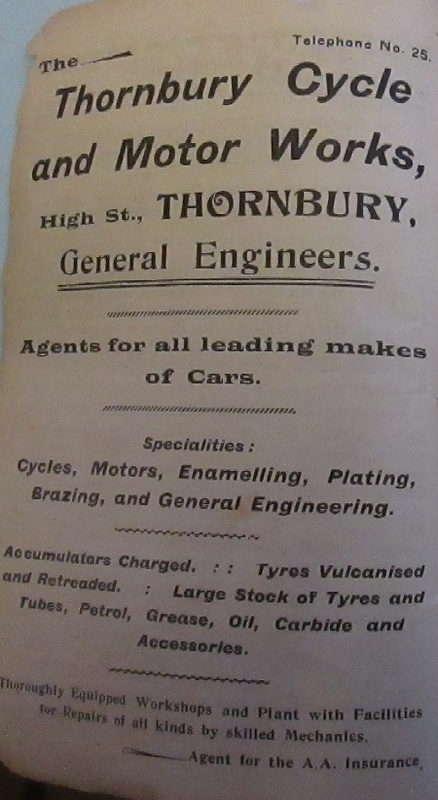 However we found an advert for Thornbury Cycle and Motor Works in 1914 Prewetts Directory . Click on the thumbnail on the left to see the full image. This shows that the works were located in the High Street. We can’t be sure of the exact location. In the 1915 Prewetts Directory the Thornbury Cycle and Motor Works is not listed. However a listing appears for the Berkeley Vale Motor Company, showing their address at an unidentified location in the High Street. We know that the Berkeley Vale Company had been founded in 1910 at their location near the Ship. One possible explanation of this situation might be that Berkeley Vale Motors had taken over their competition in Thornbury and for a short time they were trading from both locations – and the advertising board would suggest they both might have been located at 2 High Street. We have no knowledge of any other occupant in that property at that time and it did have a large doorway allowing access to the rear of the properyy. Cecil Cook – the 1925 Valuation List and 1926 Rate Book show that the property was then occupied by Cecil Cook as a tenant of J. H. Williams. Cecil was born on 23rd September 1896 and baptised on 21st October 1896. He was the son of Alfred Cook, a farmer and his wife, Ann. In April 1901 Cecil started at the National School and his address at that time was Lower Morton. Cecil was taken away briefly in 1906 when he left the area. He returned later that same year when he was listed as living in Whitfield. He left school in 1910 to start work. At the start of the First World War, Cecil was one of the first to join up. He enlisted in the South Wales Borderers on 1st September 1914. He was aged 19 years and 11 months. His enlistment record shows his next of kin as his father, Alfred Cook, of Morton House, Morton. Cecil was described as 5ft 6inches in height, weighed 142 lbs, chest when expanded was 35.5 inches with a range of 2.5 inches, fresh complexion, brown eyes and brown hair. Cecil only managed to serve for 45 days as on the 15th October 1914 he was discharged as being medically unfit for further military service. In 1921 he was living at Morton House, Morton. In 1923 Cecil married Agnes Amelia Vaughan in the Bristol area. Agnes was born on 29th September 1895, the daughter of Sergeant James Vaughan. They had one child, Joan V Vaughan born on 15th August 1923. Cecil ran a small grocer’s shop also selling corn corn and meal. We understand that when Agnes’s father died in 1930, her mother, Mary Ann Vaughan, moved to live with Cecil and Agnes. During the war Cecil took on the role of Special Constable. The special register compiled in 1939 shows MCecil and Agnes were living in the house with heir daughter, Joan and Agnes’s mother. Mary Ann died in 1945. Agnes died aged 53 on 20th October 1948. Cecil carried on living there until at least 1954. By 1958 he had moved elsewhere. Cecil died aged 73 on 31st January 1970. The Tuckers – the 1958 electoral register shows the house was occupied by Victor L and Joan Tucker. We don’t know much about them and the didn’t stay long. Victor L. G. Tucker was born in Cardiff in 1918. He married Joan Murray in Cardiff in 1941. They had a son, Peter J born in Cardiff in 1942. They had moved away by the 1961 register. However we do note that there was an advertisement in the 1961 programme for Thornbury Flower Show for J Tucker at 5 High Street. This shop sold groceries and provisions. Godfrey and Margaret Bryant – a programme for the Thornbury Flower Show in 1962 shows that the property was used by ‘G & M Bryant’ grocers and provisions. The 1965 and 1970 electoral registers show that Godfrey and Margaret were living in the house. Godfrey Bryant was born in the Thornbury area on 11th November 1921, the son of George Bryant and his wife, Annie K. (nee Walker). Godfrey had married Margaret V Miles in the Stroud area in 1948. Margaret was born in the Stroud area in 1925. We have a memory of buying cheese at the shop in the late 1970’s. We are not sure who was running the shop at the time. David Smith – in 1978 David Smith moved his gents outfitters shop from 3 The Plain (which he was sharing with Hawkes selling handbags) to 2 High Street. The photo on the right shows the shop. Click on it to see a larger image. It became a popular shop, particularly amongst the farming community around Thornbury and he specialised in trading at the agricultural fairs at various places around the country. David was involved in a number of other organisations including The Almondsbury Memorial Hospital Trustees, Thornbury Chamber of Commerce and the Thornbury Lights Association, also serving as a justice of the peace for many years. He was a stalwart of the equestrian community for more than 40 years, serving as the chairman for the horse show and as treasurer for the Berkeley point to point. He retired about 2008 and died in Summer 2016. In 2008 the shop became the Thornbury Book Shop which moved there from St Mary Centre. We understand it is still owned by Mrs Love, a descendent of the Williams family who had owned the property since the 1880’s. The front of the shop has been slightly altered in very recent years and the entrance to the yard and stable that was referred to it the advertisement of 1866 is now a window and doorway leading to offices above. By 2014 the shop was selling furniture, gifts and home accessories under the name of ‘Maison Interiors’.